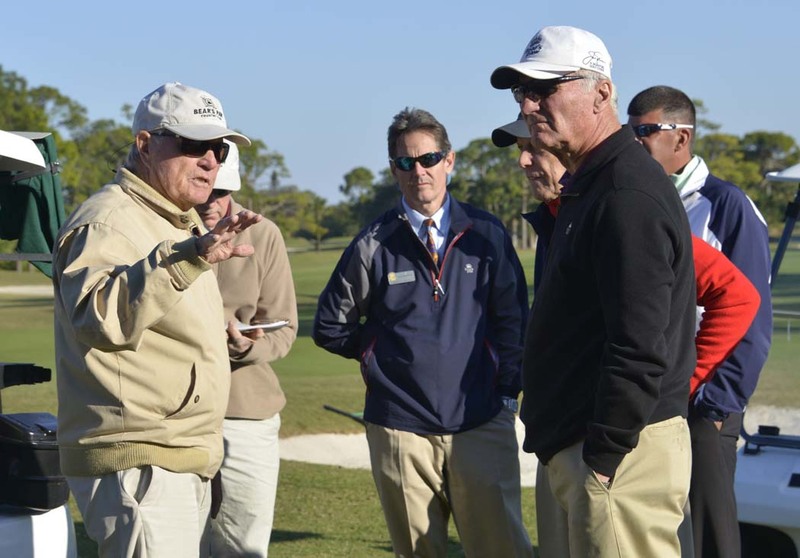 Jack Nicklaus recently made his second visit in three months to Bear’s Paw Country Club, his first Signature Course in Southwest Florida. The Golden Bear is personally guiding a restoration project as the Club nears its 35th anniversary. Last year, the club’s membership voted overwhelmingly to have Nicklaus Design restore the Signature Course, using the Golden Bear’s original drawings. The restoration includes rebuilding all 18 TifEagle Bermuda grass greens to USGA specifications; redesigning and expanding the practice areas; regrassing of fairways and roughs with Celebration Bermuda grass; installation of a state-of-the-art pump station and HDPE irrigation system to maintain the new turf more efficiently; concrete cart paths; and adding new comfort stations on both the front and back nines. The golf course officially closed April 7 to begin work and is scheduled to reopen November 1 in time to celebrate the Club’s 35th anniversary. Bear’s Paw is working with the Nicklaus Design team to ensure that the aesthetics and playing characteristics of the original design are maintained, while affording Bear’s Paw the opportunity to update and modernize the original design in a manner consistent with the current design criteria used for all his Jack Nicklaus Signature Golf Courses. The restoration will improve playability, further enhance the enjoyment level of the course, improve the visual aspect of the shot or hole, and make a more “memorable” experience, especially for those who play the course for the first time. Nestled in the heart of Naples, Florida, Bear’s Paw Country Club opened in December of 1980. There are 296 resident members at the Club. The Jack Nicklaus Signature Course meanders through the beautiful native areas on 245 acres. The well-appointed clubhouse is complemented by four har-tru lighted tennis courts, two lighted bocce courts, a standalone fitness facility and yoga room. Bear’s Paw also has a marina with Gordon River access to the Gulf of Mexico.